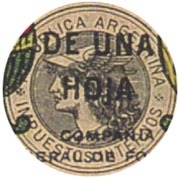 1895-1905. CRIMSON. The background shading is denser, and the lettering is smaller. 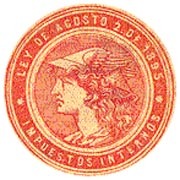 1895-1905. BLACK. The background shading is denser, and the lettering is smaller. 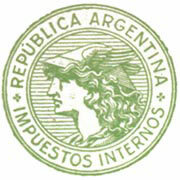 1906-21. BROWN. The background shading is denser, and the lettering is smaller. 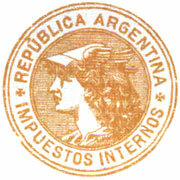 1906-21. GREEN. The background shading is denser, and the lettering is smaller. 1922-43. BROWN. The background shading lines are further apart and the typeface has changed. 2 inner circles. 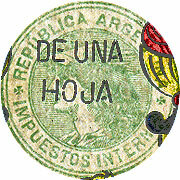 1922-43. GREEN. The background shading lines are further apart and the typeface has changed. 2 inner circles. 1944-52. BROWN. The upper lettering is in a different typeface and the circular outlines have changed. There is only one inner circle. No accent on word 'REPUBLICA'. 1944-52. GREEN. 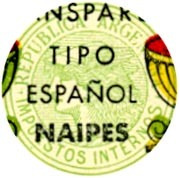 The upper lettering is in a different typeface and the circular outlines have changed. There is only one inner circle. No accent on word 'REPUBLICA'.